Slanted walls give you a true sense of life inside a pyramid while adjoining suites allow plenty of room. The Pyramid Suite features a soaking tub, separate sitting room, and a spacious king bed that await your arrival. 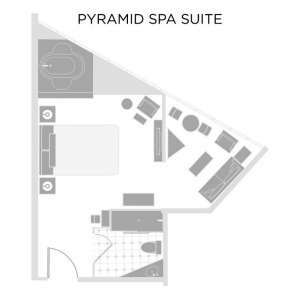 The floor plan for the Pyramid King Suite.